The Devils seem to be taking one step forward and two steps back this season, as they try to pull this season together. After beating the New York Rangers, they lost two of three last week, and both losses were by just one goal. In the month of December alone, the Devils have dropped five one-goal losses out of their six and while some of those included almost-comebacks, they just couldn’t get it done. It’s encouraging to see Damien Brunner put up three goals in three games, especially after his lengthy scoring drought of 17 games. And, Dainius Zubrus posting two in New Jersey’s 3-0 win over the Tampa Bay Lightning helps, as well. But as the season marches forward, there’s no time for the Devils to pat themselves on the back when they’re losing more than they’re winning. Head coach Pete DeBoer is tired of moral victories – pulling within one goal in the 3-2 loss to the Pittsburgh Penguins after the visitors scored three in the first period, as one example – and I’m sure the players are, too. There’s been a decent amount of talk of “puck luck,” and the fact that the Devils don’t have it so far this season. Their shots seem to have found the post more times than the back of the net; they’ve suffered from flat-out wrong calls against them; and more than their fair share of injuries have plagued them. But something’s got to give. It feels like New Jersey is right on the brink of their tipping point. That also means, though, that they could continue just missing wins that are within reach and have their season spiral out of control. They’ve fallen to 12th in the Eastern Conference standings, with 32 points alongside of two other Metropolitan Division opponents – the Columbus Blue Jackets and Philadelphia Flyers – as well as the Ottawa Senators from the Atlantic Division. The two teams just ahead of the Devils are the Rangers, with 33 points, and the Carolina Hurricanes, with 35 points. New Jersey has the most back-to-back series in the league this season, and their schedule for the remainder of the calendar year doesn’t show signs of slowing down. The Devils face the Senators and Anaheim Ducks on Wednesday and Friday this week, respectively; then they hit the road to D.C. to face the Washington Capitals. They continue on the road with a game at the Chicago Blackhawks on Dec. 23, return home to The Prudential Center to face the Blue Jackets on Dec. 27, head back out to Long Island the next night for a division game at the New York Islanders, and finally close out the year at home against the Penguins in an afternoon game on Dec. 31. 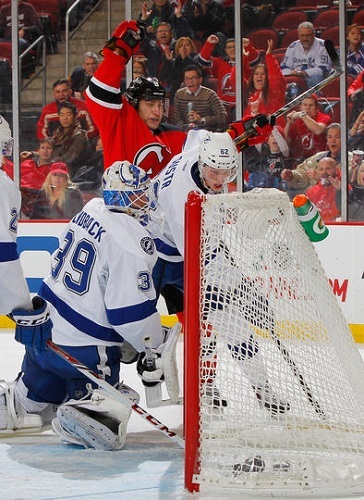 NEWARK, NJ – DECEMBER 14: Goaltender Anders Lindback #39 of the Tampa Bay Lightning looks back into the net after Dainius Zubrus #8 of the New Jersey Devils scored a goal during the game at the Prudential Center on December 14, 2013 in Newark, New Jersey. I don’t pretend to have the answer(s) for what exactly will tip the Devils season in their favor, especially since the roster changes from game to game based primarily on injuries. It’s awesome that guys like Eric Gelinas, Reid Boucher, and Cam Janssen have stepped up their game, albeit mostly intangibly, but when the production level of Jaromir Jagr drops off like it did in early December – when he failed to record a point in four consecutive games, all of which the Devils lost – New Jersey needs to find help more consistently elsewhere. Jagr is the team’s leading scorer with 28 points (11 goals, 17 assists), for an average of 0.82 points per game, and Patrik Elias, second on the team with 20 points (seven goals, 13 assists), is averaging 0.77 ppg. That sits them 48th and 56th in the league in ppg, which provides further proof that New Jersey needs to score more frequently as a team as well as figure out a way to get more guys involved with their offensive production. It’s easy to look back on a few of the Devils recent games and think, “If only,” but they’re not completely out of things yet; moving up is within reach. Plus: Bryce Salvador has started practicing with the team after sitting out with a foot injury for the past 25 games. When he was named Captain prior to the start of the lockout-shortened 2012-13 season, much was made about his lead-by-example M.O. ; hopefully his return will light a fire under the Devils. Additionally, Ryane Clowe was medically cleared to play after sustaining a head injury and missing 28 games. Minus: Where the heck has Adam Henrique been? He has recorded just two points (both assists) in seven games this month so far, and only five points (two goals, three assists) in the Devils 15 games in November. He’s one of the players that the Devils need to be more productive in the stat columns.